"To all the amazing people at Lost Pet Finder that shared my post far and wide in regards to our missing lynx point Ragdoll Turbo. Turbo is 3 years old and is our 5 year old granddaughters cat. He’s a much loved part of our extended family and went missing after moving to the Northside of Brisbane at the beginning of March. 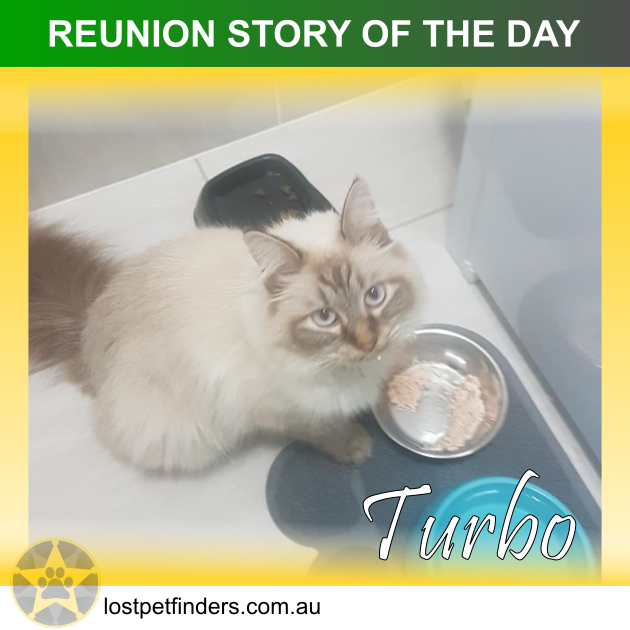 Turbo went missing 4 weeks ago and we automatically started to advertise on many lost pet sites and with the RSPCA and Facebook community groups on the Northside and we also put posters up around the area. We’ve had an emotional time over the past 4 weeks and a very upset little girl and two boys not knowing where Turbo was or even if he was alive??? Pet finder have been wonderful in regards to continuing support and contacting me to check if we’d had an updates on turbo? Well surprisingly last night at 6.30 I received a phone call that was the best news!!! Turbo was found and was safe inside these lovely peoples house waiting for my son to pick him up! He’d been hanging around there on and off for a couple of days and they thought they’d check his collar and lucky we had his contact details and name on his tag!!! Turbo went missing from Griffin and he made his way (with out being run over)??? down along the Bruce Hiway and across the pine rivers bridge all the way to carseldine , he had traveled over 10.5 klms and I have no doubt he was heading back to his old house on the Southside of Brisbane!! He’s lost a lot of weight and a little frightened still but happy to be home and very sooky but lapping up cuddles!! To anyone that’s missing their fur baby, please don’t give up hope and if you’ve moved to a new home have no doubt they will try to go home so advertise in those areas as well!! And be a responsible pet owner and have your pet microchiped, desexed and a collar with contact details as this is what returned Turbo to us!! Again a huge thank you to everyone for caring enough to share our lost posts.